Talk about bloomin’ chic, says Katie Wright. Meghan has made mum-to-be style look easy. Even before she officially became part of the royal family, the Duchess of Sussex had achieved bona fide style-icon status. Every outfit was pored over, and her high-street choices would usually sell out in a matter of hours. So when it was announced in October that Meghan was expecting her first child with Prince Harry, royal watchers were eager to see how she would adapt her style during pregnancy. Now, with the 37-year-old seemingly due to give birth in a matter of weeks, it’s safe to say she’s really knocked it out of the park when it comes to maternity fashion. Throughout months of royal visits, red carpets and trips to Australia, Morocco and more, she has always looked fabulous – whether in a designer gown, bespoke coat or casual ensemble. In fact, even if you haven’t got a royal budget available, perusing the Duchess’ maternity fashion choices offers some excellent inspiration for styling a growing bump. 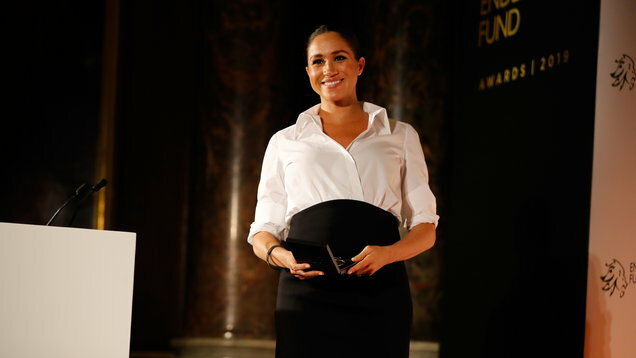 Meghan’s most frequently worn item during the latter stages of her pregnancy? It’s got to be stretchy wool and jersey dresses in block colours, often with a high neck. It’s wise to invest in a few well-made staples that make you feel great, and will fit your bump as it grows. That way, you can simply alternate your jewellery and accessories to create new outfits.